This is a bowler bag made with the traditionalist in mind. 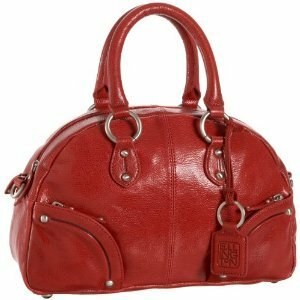 Its playful dome shape works well with the bright red Italian leather finish to create a look that seems as if it's stepped right out of the 50s. Can't you just imagine a secretary or copy writer from decades gone by stepping out of the office carrying this beauty? Pair it with a long trench coat and you've got a gorgeous vintage look! Not that this won't work for girls in the modern world. I think it could add a charming dose of vintage flair to a pair of figure hugging dark denims and a cute blouse. The style has won me over, but it's the practical details that make the Brooke a keeper. Those cute rounded corners actually hide convenient zippered compartments. The interior pockets are trimmed in more of that luxury leather for added strength, and there's even a fob for your keys. At $169, this Brooke bag represents a great investment for years to come. The black Ellington Brooke bowler bag, a great alternative to this red bag.